The New 'Conceal & Define concealer' by Makeup Revolution is an amazing offering that gives you flawless natural finish.It is a lightweight yet full coverage concealer that covers blemishes, evens skin tone and counteracts dark circles, with a matte finish that won't settle or accentuate fine lines and pores. Long wearing intense pigment that can also be used to contour and add definition. The concealer features large doe foot applicator that allows for smooth application and won't drag on the delicate skin under your eyes.The concealer for everyone. 18 shades ranging from fair to deep, in cool, neutral and warm undertones. Highly Pigmented and Blendable formula. Hides blemishes, dark spots, pores and evens out skin tone. Gives a natural, flawless finish. Full Coverage and Long lasting stay. Darker shades can be used to contour and define. C0 A " Pure white. For the fairest skin tones. Explore the entire range of Under Eye Concealer available on Nykaa. 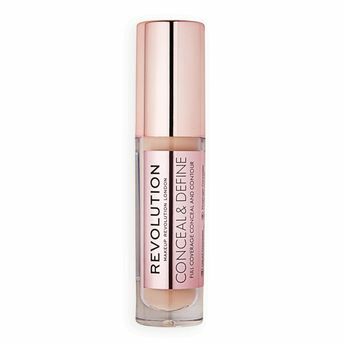 Shop more Makeup Revolution products here.You can browse through the complete world of Makeup Revolution Under Eye Concealer .